Central Industrial Security Force (CSIF) is scheduled to conduct PET/ PST for the recruitment of Constable/Fire (Male) posts from 14th March to 10th April 2018. A huge number of candidates who are looking for the jobs applied for the exam. Candidates who had applied are searching for the CISF Physical Test Admit card as it is the crucial document to carry for the exam and contains details regarding exam venue, roll number etc. CISF released Fireman admit card 2018. Candidates can download admit card from the direct link provided below. The Central Industrial Security Force (C.I.S.F) is a Central Armed Police Force in India. The CISF provides security cover to 300 industrial units and other establishments located all over India. is just a unique organization in paramilitary forces for India, which works for sea ways, airways and some of the major installations in the country. It releases notification and conducts various examinations for the recruitment of eligible candidates in different departments. This year it has released notification for the constable fireman posts and the candidates who had applied can download admit card from the official website. The Central Industrial Security Force (C.I.S.F) released notification and invited online applications for the recruitment of 332 Constable Fireman posts. A huge number of eligible and interested candidates applied for the exam. 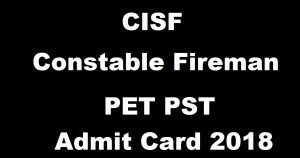 Candidates who had applied can download CISF Constable Fireman PET/ PST admit card from the direct link provided below. Without admit card candidate is not allowed to write the exam. 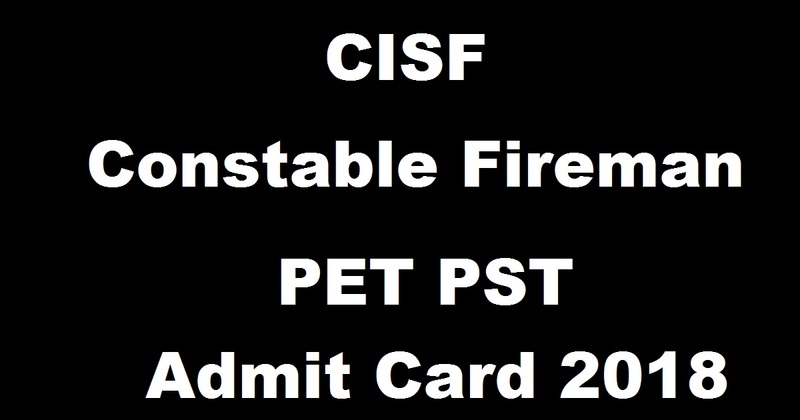 Click on CISF Constable Fireman Admit Card. Stay tuned to this website. We will update CISF Constable Fireman results here. Press CTRL+D to bookmark this page for easy navigation.